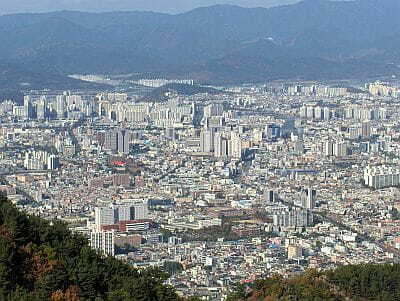 In Daegu (or Taegu), a Korean city, located in the southeast of the country, the climate is temperate: winters are cold but sunny, while summers are hot, muggy and rainy. Like the rest of Korea, the city is affected by the monsoon circulation: in winter the northwest cold currents prevail, while in summer they will be replaced by hot and humid currents of tropical origin. Spring and autumn are transitional periods, mild and pleasant, especially the month of October. In winter, the average temperature is a few degrees above freezing (0 °C or 32 °F); there are quite mild periods, with highs around or even above 10 °C (50 °F), but also cold periods, and sometimes freezing. In the worst moments, the temperature can drop to -13 °C (9 °F) or even below, though it goes better than in Seoul, where the temperature can reach as low as -20 °C (-4 °F). Snow is quite rare, both because of the position in the south-east of the country, and because of the scarcity of precipitation in winter, however, sometimes it can snow. Spring is mild, but the rains increase gradually. However, owing to the summer monsoon, the rainiest season is summer: from June to August, more than 600 millimeters (23.5 in) of rain fall. The rains can sometimes be heavy. However, it must be said that the Daegu area, sheltered by the mountains, is one of the least rainy in Korea. In summer, there can be periods of good weather, which can be very hot, with highs about 35 °C (95 °F) and above (in fact, given the position of the city, here the heat is felt in a particular way). In autumn, rainfall decreases, and by October the rains are quite rare. Here is the average precipitation. From July to early October (and occasionally also in the second half of June), Daegu can be affected by typhoons, the tropical cyclones of South-East Asia. The amount of sunshine in Daegu is good in winter and also in spring and autumn, when there are several sunny days, but it decreases in summer because of the monsoon, and reaches its minimum in July, when cloudy skies prevail (the percentage of sunshine drops to 34 %). Daegu is the starting point from which for visiting some important Buddhist temples. On the slopes of Mount Palgong, 1,193 meters (3,914 ft) high, visible from Daegu to the north of the city, there are a number of Buddhist temples; the temple of Donghwa is located to the north-east of the city, 500 meters (1,600 feet) above sea level; while the Gatbawi Stone Buddha is at 850 meters (2,800 ft) above sea level and to the east. Not far away from Daegu are two of the three main temples (the Three Jewels Temples) of Korea: about 45 km (28 miles) south-west of the city, and at 650 meters (2,100 ft) of altitude, is the Haeinsa Temple, a UNESCO World Heritage Site, home to the Tripitaka (Korean Canon), a collection of Buddhist wooden tablets; about 55 km (35 mi) south-east of the city we find the Tongdosa Temple; the third temple, Songgwangsa, is located 150 km (95 mi) away from the city, in the south-west of the country. About 60 km (35 mi) east of Daegu, near the coast, we find the complex of Bulguksa, and in the vicinity, 650 meters (2,100 ft) above sea level, we find the Seokguram Grotto, both UNESCO World heritage Sites. 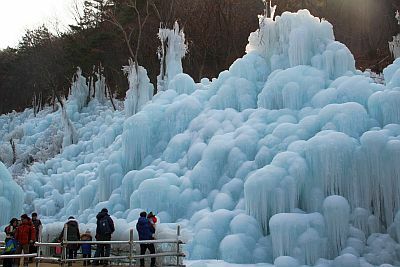 In winter, when the temperature allows, to the southwest of the city you can visit the Biseulsan Recreational Forest, where you can admire a landscape made up of ice hills and icicles.